PIXEL- the smallest element in a raster. A pixel represented the basic idea fo our design and can be found in numerous variations throughout whole interior and coincidentaly is also represented in Cinemax new logo. Our main focus was to create a scenic atmosphere throughout the whole interior. Whole CINEMAX is divided in areas with specific atmosphere and function, yet is coherent in its design. The entry area consists of foyer and coffee place. The central counter made of triangular surfaces is the visual highlight of the space framed by delicat details of floor, 3d cladding on walls and pixelated lights on the ceiling. This area is full of life and is trying to capture the experience of moviegoing. Behind the foyer you'll walk in the area connecting all the cinema rooms with continuation of the 3d cladding on the walls as seen in foyer, but with generaly calmer atmosphere with darker colour tones, where moviegoers can absorb and discuss the movies, they have just seen. 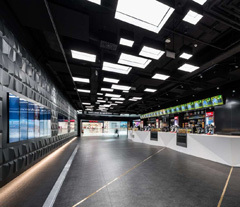 Third area are the cinema rooms, where the space was designed to be very elemental, with dark walls, floor and ceiling and accented red seating. All this to maintain the connection between moviegoers and the movie with no distractions. The fourt area is the VIP lounge, which is an exclusive space for visitors that demand and pay for more discrete aproach with separate doorways to the halls and other VIP services. The main colour range of the interior consists of black/antharcite with a pinch of white and gold. The walls are covered with 3d recycled cladding, which was painted gold specifically for this project. The floor in foyer is made of vinyl with assymetrical brass lines (which were supposed to contain famous movie quotes) and a carpet was used in halls and other areas.